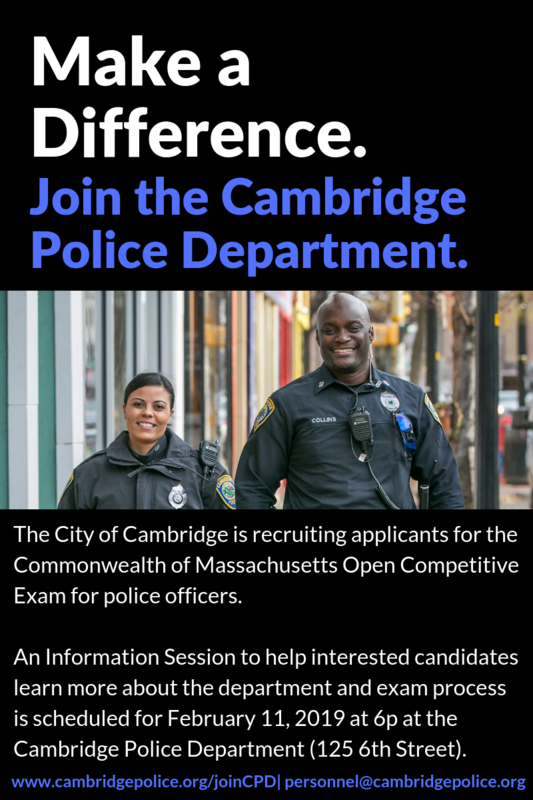 Interested in becoming a Cambridge Police Officer? In advance of the next biennial Civil Service exam that is scheduled to take place on March 23, 2019, the Cambridge Police will be holding an Information Session for interested applicants on Monday, February 11 at 6p in the first floor Community Room of the Cambridge Police Department, which is located at 125 6th Street. The Cambridge Police Department is located inside the Robert W. Healy Public Safety Facility at 125 6th Street, Cambridge, MA 02142. The department is just a short walk from the Red Line Kendall/MIT Station and the Green Line Lechmere Station. Interested applicants can get more information on the application, hiring and selection process, timelines, and meet with officers to ask any questions. To sign-up and secure a seat at this Information Session, please e-mail personnel@cambridgepolice.org. The early application deadline is February 5, 2019. The final application date is February 19, 2019. Visit www.mass.gov/civilservice or www.cambridgepolice.org/joinCPD for more information.